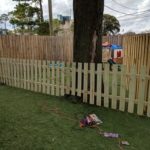 Helped The Parke House Academy build a new fence for their little ones. Some of the 4x4s were reclaimed from my fence that I was replacing. After building, sanding was needed to make it nice and smooth.